Gladius - The sword that forged the mightiest empire in the ancient world, the Gladius was the primary weapon of the Roman foot soldier. It was developed early in the third century B.C., perhaps not coincidentally about the time Rome began bringing Italy into its sphere. The Romans were not especially known for originating their own ideas; what they were known for is taking another culture's ideas and improving upon them. So it was with the Gladius. The first incarnation of the sword was called the Gladius Hispaniensis, because it is believed to have been borrowed from the Celtiberian tribes of Spain. It was a straight, double-edged sword with a sharp tapered point, designed specifically for thrusting. The Romans adopted the Greek phalanx as their battle formation and they protected themselves with a large tower shield (the Scutum). This tight formation did not lend itself to an unwieldy slashing motion and a disciplined Roman soldier was trained to thrust the Gladius into his opponent's abdomen which, if successful, usually resulted in his death. In the unlikely event the phalanx broke down, the sword could still be used for slashing if called for. Over the centuries it was modified into several different designs. From the Hispaniensis, common during the Republic, came the Gladius Mainz, which was slightly wider and had a shorter more rectangular point. The Mainz was introduced near the beginning of the empire and helped push the borders of the frontier to their largest extent. The Gladius Pompeii, named after the Roman town, was the standard domestic Roman sidearm. It was longer with a duller point, and the most common of all Gladii in Roman times. And finally, the Gladius Fulham, named because it was discovered on the banks of the Thames near Fulham, looks like a composite of the Mainz and Pompeii; long like the Pompeii with a sharp point, like the Mainz. It appears to have been the Roman sidearm for soldiers in Britain. 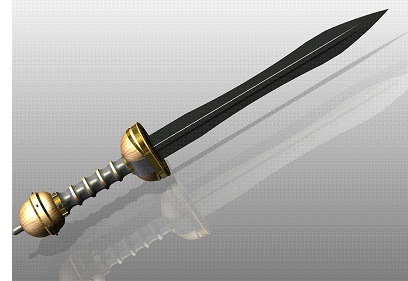 The word "gladiator" comes from gladius. Near the end of the empire, the army adopted the Spatha, which was different from the Gladius. We don't really know why. Perhaps a change in battle tactics.